Just one month after the mayor of a small Montgomery County borough went public about the death threats and racial attacks made against him, he said new concerns have surfaced about his safety. Bridgeport Mayor Mark Barbee is scheduled to be sworn in to the first state LGBTQ Affairs Commission at tonight’s Borough Council meeting. But new threats leveled against him have turned reason for celebration into a cause for worry. In this case, Barbee and others maintain that Borough Council President John Pizza learned of threats to the mayor’s safety and shared them with the borough's manager, solicitor and, later, Montgomery County detectives. According to Barbee, borough officials have deemed it a “confidential” matter. In a Tuesday morning phone interview, however, Pizza maintained that Barbee's concerns were somewhat overblown. "There were no threats against Mark or any council members, sir. The threat was no threat. It was a concern that a certain individual might be close to the edge," said Pizza, noting that he "did not keep that information from anyone. There are too many lunatics in the world." The mayor, who learned of the threats with "vague" information last Wednesday, said he shared that scenario on Monday with investigators from the Montgomery County District Attorney’s Office. A spokeswoman for the D.A. 's office had confirmed an investigation was launched before the most recent concerns were raised. Pizza said that he also spoke with a District Attorney's office detective about it, but that didn't really soothe Barbee's concerns. “They tell me there are threats to my safety but I’m not supposed to tell anybody? Yeah, no. I’m not accepting that,” Barbee told PhillyVoice. “This is my reality. It's getting harder to stay strong." 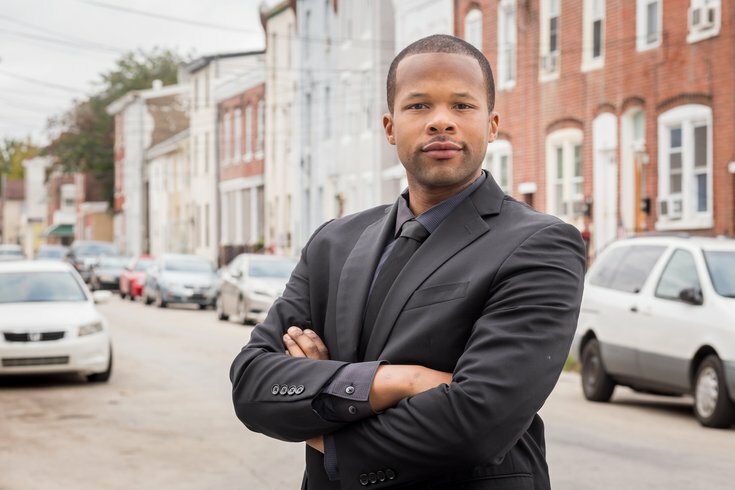 When the 29-year-old Barbee was elected to the top spot last November and sworn in two months later, he became the tiny blue-collar borough’s first openly gay African-American mayor. Over the course of the next nine months, he would be subjected to death threats, profane tirades at public meetings and a slew of racially charged comments – both veiled and otherwise. Just one day after PhillyVoice shared his story, the Borough Council unanimously passed a resolution condemning hate speech and the councilman behind the public meeting tirade would soon resign his post. If Barbee thought that was the end of his troubles, though, he would quickly be proven wrong. 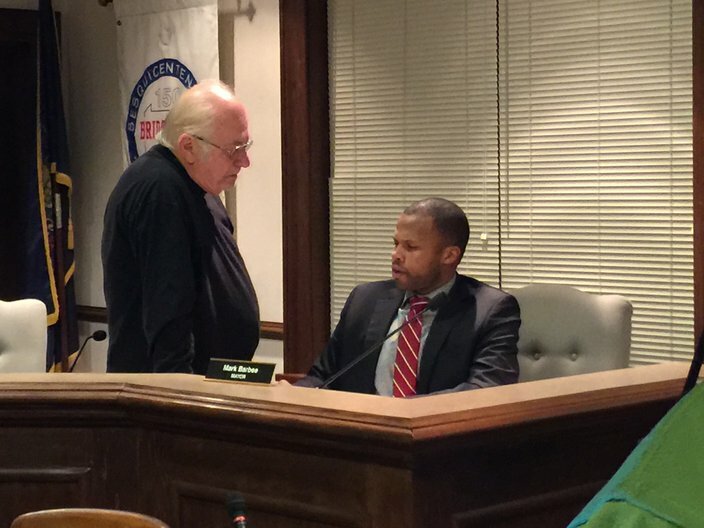 Bridgeport Borough Council President John Pizza, standing, and Mayor Mark Barbee share a few words after yet another heated meeting in September 2018. He would soon learn that Pizza, the council president, got word of a “potential threat to my safety at the next public meeting,” which will be held at Borough Hall tonight. “It was serious enough to notify me, and say they would enhance (police) patrols at the next meeting, but there was no investigation or no call for more information about it,” said Barbee. “They said they’ll try to get the person with information to come forward. ... It's hard to see it as a coincidence that these threats would surface after announcing my swearing-in to the Gov. Wolf-appointed LGBT Commission." Salvatore Bello, the borough solicitor, had an explanation for that perception. He said the borough "received third-party information which could reasonably be perceived as a threat" but that there was no specific name attached to its target. "Given the abhorrent statements made concerning the mayor on social media in recent weeks, it is completely understandable and justifiable that the mayor may have perceived this new information to be a personal threat," Bello said. "However, there is credible evidence that any actual threat could be directed at one or more other individuals, the mayor or the entirety of Borough government. "The Borough Administration and the Solicitor's Office immediately contacted the authorities, in an abundance of caution, upon receipt of this information." Considering that much of the tension in Bridgeport revolves around the police department – and the exit of a former chief who said the mayor pushed back politically against his plan for “aggressive patrols” in a targeted section of town – Barbee said this latest dust-up has left him feeling uneasy at best. “I’m taking matters into my own hands with safety concerns for myself. The only thing they want to do is throw extra cops in the room. The last time they did that, I was attacked,” he said, alluding to officers applauding a councilman who yelled at him during a council meeting. For his part, Pizza couldn't discern "why wasn't he willing to have extra cops there if he's so concerned?" He also noted that Barbee hasn't taken him up on several offers to meet and hash things out. So what’s going to happen tonight? Barbee spoke to the judge who will swear him in to the state LGBTQ commission to warn him of the potential threat and give him a chance to back out. That offer went unaccepted. He also noted that he’s declining the offer of extra borough police officers in the room and planned to request Montgomery County Sheriff’s deputies handle security at Borough Hall in their place. “There are legitimate threats to my safety and nobody gives a f***,” he said. “Even after all the attention this has gotten, this is where we’re at? I can’t take it anymore."